In Qatar, the sea and the beach are easy to find. At least the Khor Al Daid is. The Khor Al Daid is also referred to in English as The Inland Sea. It is also one of the most impressive natural formations in Qatar. 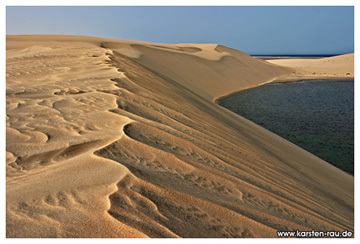 Many people visit this huge inlet surrounded by sand dunes in order to take in the full beauty of its popularity. Be careful though, most car insurance plans don’t cover the off-road terrain of the inlet, so be sure to get that squared away if you plan a trip there. There are no roads leading to this beautiful place, but people make it there by going off-road. A convoy would be safest to take in this situation because the more cars you have, the better the chance that everyone will arrive safe and secure. There is a tour group you can book as well, should you want a type of all inclusive package deal. There is an extreme driving package that should only be booked by people with a taste for adrenaline. The tour drivers are very skilled in extreme driving situations and will push their vehicles to the very limit to give you your moneys worth. If this is not your cup of tea, opt for the standard tour option. You get to fly up the sand dunes and test the very limits of gravity as the drivers take you on the ride of your life. Rest assured, it’s not for the faint of heart. There are no extreme driving stunts in the standard package. After the dune rides there is camping by the beach. This would be a phenomenal way to say I love you to someone special. And if nature itself isn’t enough, you also get to enjoy their provided barbecue and take as many hits of a shisha (water pipe) as you would like. You don’t have to stop until your satisfied. There are even tiny desert flowers to gaze at during the wet season. You might be wondering about the shisha. Well, water pipes and herbal blends are very popular in the middle east and places like Qatar. It is very customary to see people smoking a shisha right out in the open. There are some herbal blends on this trip that could really add some spice to your life. Of course, it is always optional to smoke or not and you won’t get any pressure from the tour guides. So, if you’re looking for a tourist or adventure package that has it all, look no further than a trip to the Inland Sea. There are many places in Qatar to take off-roading adventures, but not many offer the beach side view and camping trip. They have gotten rave reviews and people really love this trip. Don’t take our word for it, you can find a ton of reviews on the Internet that will tell you the same thing. This trip rocks!